Let's go on an egg Hunt!! I love it when Designers on our team come up with unique ways to combine our products that I never would have though of! Today's layout by Samantha is the perfect example of this! 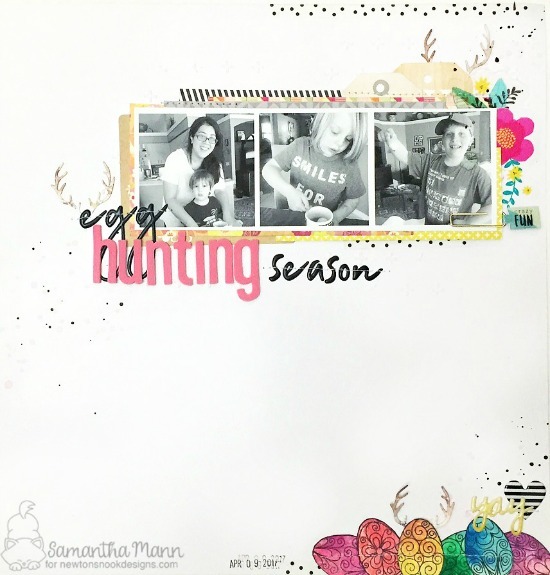 She used the fun eggs from our Beautiful Spring stamp set and and combined them with the antlers from our Splendid Stags die set to create an "EGG HUNT" scrapbook page!! This is such a fun idea and unique way to combine these products! The rainbow of colors she used on the eggs is so fun and beautiful against the white page too! What a wonderful way to remember a fun day! Thank you Samantha for awesome inspiration today! To say hello to Samantha and see more of her awesome creations, you can visit Samantha's Blog, Sam's Scrap Candy! Wow! This is absolutely stunning! Great layout!! !